Industry Voices » Free Trade or Economic War? Home > People, Politics, Reaction Media Report	> Free Trade or Economic War? Anyone going to school in the U.S. after WW II has learned the breakdown in world trade was a primary, though not only, cause of the Great Depression. It is said import tariffs and barriers caused world trade to be constrained. There is little doubt it was a cause. I grew up believing it and have done so with little retrospective most of my life. As U.S. auto plants closed in the 1980s and forward (I was a GM dealer at the time), I blamed the unions, the workers, and incompetent auto company management. Whole swaths of the country from the Great Lakes to Maine back to the Mason-Dixon Line started to lose industrial plants, in the heartland of America. They became destroyed areas, bereft of jobs and hope. The bombing campaigns of W.W. II Europe couldn’t have caused greater damage. Yet with the belief in free trade in the country so ingrained, we blamed the fallen for their fate. I was part of that crowd. It never occurred to me to ask if free trade was so good, why is its impact so disastrous for the U.S.? Not until recently, that is. And surely our race for government control of every aspect of our economy led to manacled industrial results, especially in heavy industry. But I heard our technology would bail us out. Who needed autos, steel, aluminum and other smoke stack industries, what with their pollution and dirt? Not the U.S. Uhm, we forgot we needed their jobs. This all played a terrible self-destruction to our heavy industry and their secondary affiliates. The politicians in power either didn’t see the developments, didn’t have answers, or didn’t care. We have seen recently how quickly our economy can respond when unleased. How hard was that? It’s obvious that the last 30 years, especially our last 8 years prior to 2017, that one of the most important OleMartyBoy Principles was not understood by our heros in government: “You get more of what you encourage and less of what you discourage.” Simple, eh, but entirely overlooked by our government until last year. I understand Free Trade means that each of the parties share similar rules as to access, tariffs, government industrial financial assistance and the like. Each of the parties is to operate in trade under similar rules, with shared understandings. Still, the economic talking points by the media trumpet Free Trade, when even the dead and buried know there is little of it with many of our trade partners, especially The People’s Republic of China. That is the problem seemingly overlooked when media discussions center on the subject. Often the quoted experts are those who profit from trade, free or not, usually the finance contingent. When a trading partner has rules heavily skewed in their direction, as in the case of China, it is very difficult to achieve free trade. Does each party have similar access to the other’s markets? Are tariffs similar? Are privately owned companies in the U.S. competing against government backed Chinese companies who can survive long after a privately-owned U.S. company would be long gone, and thus undercutting its pricing? And most importantly, does the other country operate in a relatively free market? China has over a billion plus person population. It is a giant country that has been backward, isolated and extremely poor. Coming out of W.W. II, it had a puny, agrarian economy. Its communist dictatorship created a command economy. The U.S., as it had done with Germany, Italy, Japan, and non-communist Europe helped re-establish the shattered economies of these countries with trade. China, under the yoke of brutal Chairman Mao, spent much of the post-war period avoiding the U.S. and brutalizing much of its citizenry. Like all old men, The Great Prick, Mao finally died. A special place is reserved for Him in Hell. The new generation of Chinese leaders decided their best bet to continue to rule the dictatorship was to open their economy to trade so fewer of their citizens starved every year. We now enter in the final phase of that stage in China. It’s emergence as a world power has been achieved by an almost capitalist drive for growth and trade. Now that fewer of its citizens are starving, it has turned its attention to waging an economic war on the rest of the world. After the war, Germany sprung economically quickly, Japan following behind, then most of non-communist Europe followed suit. Ex-Communist Europe still struggles. China followed very slowly for years. Their agrarian economy, lack of infrastructure, large over-population, and strict communist control hindered easy solutions for China’s emergence. But once going in the 1980s, to the present, they blew forward. And who became their greatest trading partner and deliverer of free technology they seemed incapable of creating? Why, good old Uncle Sam. Sam made many concessions to the Chinese to help them economically. In fact the emergence was so great, that the New York Times’ ace reporter, Tom Friedman advocated the U.S. should adopt the Chinese model for the economy. We saw how well that direction worked with the economic performance of Tom’s favorite President, Barack Hussein Obama. I suffered thru much of the 1980’s when Japan, Inc. was running rough shod over our economy and we all believed they would easily control us. They were going to buy everything in America! Lost any sleep on that one recently? We sure did then. They were then the Asian powerhouse, akin to their speed in conquering much of South East Asia during the war, then unable to maintain their advantage against the U.S., just like in the war. In Japan, the command economy stumbled badly in the 1990s and continues to do so. Picking many winners in the economy early boosted them, but command economies seem incapable of letting the losers die, dragging down all with them, by not cleansing by dying. The losers stayed alive with government help, as many do to this day. Lying in wait in the Chinese economy lurks the same virus, as it does in all command economies, germinating even as we breathe. The trade deficit in the news is that China is enjoying a $350-$500 Billion-dollar annual trade deficit with the US and a $300 billion-dollar annual technology transfer as a gift, (actually by theft). Quickly, who has the most to lose in this transaction? China or Americans no longer able to go to Walmart to buy more cheap unneeded junk? The economic talking heads making their living on Wall Street or Washington, D.C. care little about American workers displaced for years. Deplorables! Now the economic bigshots lament the possible trade war with China because it threatens their stew, citing the loss of cheap goods for us to buy. Where were these folks all those years as hard working Americans were thrown from their jobs, in places like Buffalo, Detroit and Youngstown, all dead cities. You know, “free” trade is a must, for the elites. In this blather over free trade, the one thing I have never heard is that the actions of the Chinese constitute an economic war against the U.S., and has been since Nixon went to China. Dead soldiers, bombed cities, lost industry, and loss of fortune is the result of a shooting war. They are easy to spot. 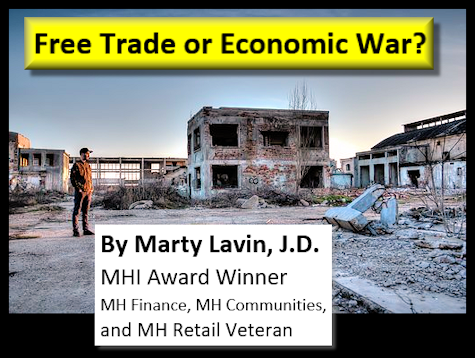 An economic war is harder to see, but the results are similar; ruined cities, lost industry, citizen agony, broken dreams, destruction of the American economy. We have been living with that. The results are easily visible. It does seem difficult to see from Wall Street and D.C. This war is being done on the backs of our workers and industry, and our economy. The trade rules are not similar. Technology is stolen en masse. Their markets are often closed to us. They are very smart people and have been out maneuvering us for 50 years. How dumb can we be? Even though they now have a first world economy, by choice they have a third world pay scale for their workers. This creates quality goods at a price our companies cannot hope to match. And between their lack of free trade and subsidy of the cost of their goods, how do our companies compete? The answer is obvious, we can’t. Thus this massive transfer of wealth from us to them, allowing them to continue their economic war unabated. This has built their new cities, airports, schools, roads and infrastructure to first world standards. Their actions in the command economy injures their workers as well, keeping a massive economy acting like they barely succeed with worker earnings. But this action is getting pushback as countries wake up from their slumber. Martin V “Marty” Lavin, J.D. Editor’s Notes: Marty is a community, retail, and finance veteran who is an MHI award winner. Note 2: The content is penned by Marty, but the illustrations are provided by the editor.